HF-1 Two Stage Nickel-Zinc Ferrite RF Choke. K-Y Filter Company Model HF-1 SUPER RF Choke Specifications. The RF choke used in our telephone/modem interference filters has two sections. Each section is bifilar wound on a nickel zinc toroid core (Amidon FT50B-43). Inductance...........................................approx. 2.0 mH (1.00 mH/section)(that's milliHenries not microHenries! ), over the HF and MW portion of the RF spectrum. 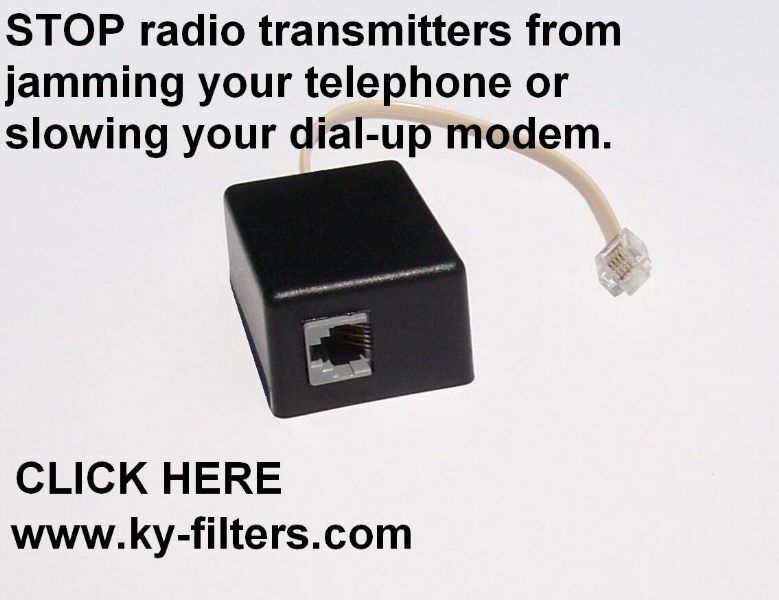 Click here for more details on the inside of the RF-1 modem/telephone plug-in filter. To order plug-in filters, with free shipping, click here! (We ship international orders Air Mail.) Absolute unconditional money back guarantee!